The Psalmody and the Canticles are sung antiphonally, i.e. responsively by whole verse on the part of two groups (half-choirs: Choir I and Choir II). The Psalm-Tones are set up for this kind of antiphonal responsive singing, according to their musical structure. It is inadvisable to sing the Psalmody responsorially, i.e. responsively between liturgist and congregation, liturgist and choir, or cantor and choir. The Psalm, always being preceded by the Antiphon, is intoned by the cantor, i.e. he sings the first few notes in order to establish the tonality and tempo. If need be, it could be intoned by a few voices of the choir—perhaps three boys or men. The cantor intones in such a way that the tuba (the repeated reciting tone) does not lie under F nor above C.
Antiphonal Psalmody is, furthermore, to be divided by whole verse: each half-choir sings one whole Psalm-verse, in the middle of which (at the star *) a breathing pause is made. It contradicts the musical essence of the Psalmody to sing responsively by half-verse, so that the one choir would always begin a verse, increasing musical tension, and the other would end the verse, releasing musical tension. The Antiphon belongs to the Psalmody. As a theme-verse, it improves the understanding of the Psalm and often links it to the Church Year. 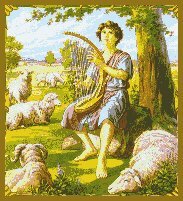 The choice of a Psalm-tone is based on the tonality of the Antiphon. Antiphon: Cantor intones until the star *. Whole choir continues and sings the Antiphon to the end. Psalm: Cantor intones the first half of the first verse with the initium, in order to set the tempo of recitation. Choir I sings the second half of the first verse. Choir II sings the second verse without the initium. Choir I sings the third verse without initium. Choir II sings the fourth verse, etc. Each half-choir begins singing its verse when the other half-choir has finished, with no intervening pause. This means that the one choir must take a breath before the other has finished singing. Verses are divided musically, not canonically. For example, Psalm 69:2, and 4 are divided into two liturgical verses. Gloria Patri: Choir I or II sings "Glory be to the Father..." on the same Psalm-tone. Choir II or I (the other choir, as the case may be) sings "As it was in the beginning...Amen." Note: Missouri Synod custom is that the whole choir sings the Gloria Patri in unison. Antiphon repeated: The whole choir repeats the Antiphon without intonation of the cantor. The cantor leads the choir and the choir leads the congregation. The organ, especially if not located in the choir area, is less suited to the role of leading the Gregorian prayer offices. If there is a choir organ present, it can, beyond prelude and postlude, take over the functions of a figural choir, can intone and accompany congregational hymns and chants, and with a large congregation, can support the singing in a restrained manner. A figural choir can execute the Psalms, Responsory, and Canticle with polyphony. The figural choir can also take over individual stanzas of the Office Hymn, or alternate stanzas in other hymns and chants. In the Psalmody, the opportunity to perform several Psalms should especially be observed. In the Canticle, a figural execution together with the unison singing of the congregation is not recommended. Here an alternation by whole verse of the figural choir and congregation may be appropriate. Source: Vereinigte Evangelische-Lutherische Kirche Deutschlands. Kleines Kantionale II. Hannover: Schlütersche Buchdruckerei, 1969. pp. 8-16. The Psalm verses are divided into two parts by means of an asterisk * according to conceptual parallelism. The enumeration of Psalm verses in modern editions of the Bible does not necessarily follow conceptual parallelism. In this Psalter, a "whole verse" is a liturgical verse of two parts. If a verse is long and can be divided into three parts according to conceptual parallelism, a dagger † divides parts one and two (which together constitute the first half-verse) and the asterisk * divides parts two and three. There is never a division of the second half-verse. If both half-verses must be subdivided, each one becomes its own whole verse, divided by the asterisk *. Next, the last two stressed syllables of each half-verse are accented. The gregorian Psalm-tones are matched with the text of the Psalm according to stressed syllables. Stressed syllables must be sung on stressed notes, and conversely, unstressed syllables must be sung on unstressed notes. Latin most often stresses the 2nd-last or 3rd-last syllable of each half-verse. E.g. Psalm 119:105 "Lucerna pedibus meis vérbum túum, * et lumen sémitae méae." English, however, often stresses the last syllable of the half-verse. E.g. "Thy word is a lamp únto my féet, * and a light únto my páth." Thus in order to use English text with the gregorian Psalm-tones, certain rules of accenting must be followed. Accenting is begun from the end of the half-verse. If possible, the 2nd-last or 3rd-last syllable of each half-verse is accented. The last syllable is not accented if the 3rd-last syllable can be accented. Wrong: "I will live and práise the Lórd." Right: "I will líve and práise the Lord." The 4th-last syllable is not accented as the final accent of the half-verse. Wrong: "as lóng as I live." If the last and 4th-last syllables are stressed, they are accented. Instead of an accent mark on the last syllable, underlining is used. Right: "as lóng as I live." Next, the 2nd-, 3rd- or 4th-last syllable before the final accent is marked with an accent. This is the "penultimate accent." The last syllable before the final accent is not accented. Wrong: "I was glád whén they said." Right: "I was glád when they said." Right: "I was glád when they sáid to me." The best accenting for gregorian Psalm-tones is ´ - ´ - . E.g. "of his péoples' práises." Nevertheless, unstressed syllables should not be accented, if at all possible. A dot · may be placed before the 3rd syllable preceding the final accent. This has been done in the Gospel canticles, since the cadence of the melismatic canticle tones often begin at that point. E.g. My soul · doth mágnifý the Lord. When the ending "-ed" is to be pronounced as a separate syllable, add a hyphen (-) to make that clear. E.g. Bless-ed. For clarity, mark silent letters by printing them in italics. E.g. Every. Syllables ending in "r" can often be counted as two syllables. E.g. "fíre-", "devóur-". When this is done, place a hyphen (-) after the word. Words like "answeredst" and "saidst" are difficult to pronounce. In the 2nd person singular, simple past, a consonant cluster occurs which is nearly impossible to pronounce. German usage places an "e" between the ending and the consonants d, t, s, and similar sounds. For example, "answeredest", "saidest". This usage is not foreign to English, as can be seen from the word "showest." Nevertheless, the common words "didst" and "hadst" should be left as is. Pronunciation of other common words: saith—seth (one syllable), shew—show. 1. If the half-verse of the Psalm-tone has one accent, this accent corresponds to the final accent of the Psalm-text. If more than one syllable follows the final accent of the Psalm-text, the extra syllable is sung on the hollow note. Hollow notes are not whole notes. They have the same length as black notes. 2. If a half-verse of the Psalm-tone has one accent with leading tones (e.g. the first half of tone IV), the tone-accent corresponds to the final text-accent, and the leading tones are sung to the corresponding number of syllables before the final text-accent. The second-last (penultimate) text-accent is ignored. 3. If a half-verse of the Psalm-tone has two accents (e.g. tone VII), these correspond to the two text-accents. If more than one syllable follows an accented syllable in the text, the extra syllables are sung on the hollow notes. 4. Whenever the final text-accent falls on the last syllable of a half-verse (stressed ultima), that syllable is underlined instead of being indicated by an accent mark. At the end of the first half-verse (mediatio), there are two manners of handling the stressed ultima. In some Psalm-tones II, IV, V, and VIII, the stressed ultima falls on the same note as the accent. In this case, the last note of the mediatio falls out and is not sung (mediatio correpta). 5. In some Psalm-tones, the stressed ultima falls on the last note of the mediatio (e.g. tone I). In this case, the penultimate tone-accent corresponds to the penultimate text-accent. The final tone-accent is disregarded. 6. At the end of the second half-verse (conclusio), there are three manners of handling the stressed ultima. If the conclusio has one accent with leading tones, the stressed ultima may fall on the same note as the tone-accent does (e.g. tone IV). In this case, the ultima is slurred. 7. If the conclusio has one accent with leading tones, the stressed ultima may also fall on the last note of the conclusio (e.g. tone I). In this case, the leading tones and accented note are sung to the corresponding number of syllables before the stressed ultima. The tone-accent is disregarded. 8. If the conclusio has two accents, the stressed ultima may fall on the the last note or note-cluster (e.g. tone V and VII). In this case, the penultimate tone-accent corresponds to the penultimate text-accent. The final tone-accent is disregarded. 9. The tones of the beginning formula (initium) are sung on the first verse of the Psalm, and on every verse of the Gospel Canticles (Benedictus, Magnificat, and Nunc Dimittis). The initium is also sung on the antiphon, if the antiphon is sung to the Psalm-tone. See figure 10. 10. The dagger († ) marks the flexa, dividing the first half-verse. The last syllable before the dagger is lowered from the reciting tone to the last tone of the initium. If the 3rd-last syllable before the dagger is accented (marked with a circumflex ^), the last two syllables before the dagger are lowered. Tones I, through VIII are the classical "Eight Psalm Tones." The versions of the tones given here is those commonly used in German Lutheranism since the time of the Reformation. (See Otto Brodde, "Evangelische Choralkunde," in: Leiturgia: Handbuch des Evangelischen Gottesdienstes, vol. 4, [Kassel: Johannes Stauda, 1961], pp. 475-476, 489). Tone IX is the Tonus Perigrinus, the "wandering tone," so called because unlike other Psalm tones, it has a different reciting note in each half-verse. "Irr." is the Tonus Irregularis, the "irregular tone." All of the tones below may be copied as a picture file, by right clicking and saving them individually on your computer. From your computer, you can place them in bulletins and other documents. If you want more flexibility with the music, we recommend purchasing the Gregorian music fonts and/or the Modern Music fonts from Meinrad. You may hear each tone sung to a Psalm by clicking the psalm link under each tone. The sound is high quality MP3 and may take a few minutes to download using dial-up connections. After the Antiphon is sung, you will hear the Psalm being sung according to the Psalm-tones.